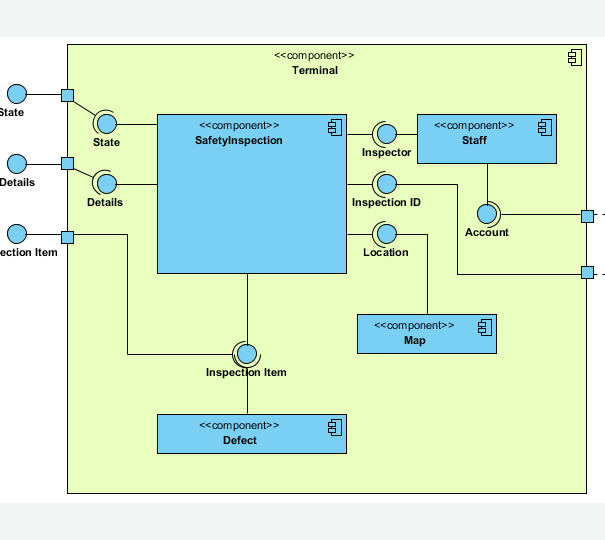 The Component Diagram helps to model the physical aspect of an Object-Oriented software system. It illustrates the architectures of the software components and the dependencies between them. Those software components including run-time components, executable components also the source code components. A kind of association that has one of its end marked shared as kind of aggregation, meaning that it has a shared aggregation. Name The name of aggregation. Visibility Determines where the aggregation appears within different namespaces within the overall model, and its accessibility. Association End From The source of aggregation. Association End To The target of aggregation. Abstract If true, the aggregation does not provide a complete declaration and can typically not be instantiated. An abstract aggregation is intended to be used by other aggregations. Leaf Indicates whether it is possible to further specialize an aggregation. If the value is true, then it is not possible to further specialize the aggregation. Derived Specifies whether the aggregation is derived from other model elements such as other aggregations or constraints. An end property of an association that is owned by an end class or that is a navigable owned end of the association indicates that the association is navigable from the opposite ends; otherwise, the association is not navigable from the opposite ends. Name The name of association. Visibility Determines where the association appears within different namespaces within the overall model, and its accessibility. Association End From The source of association. Association End To The target of association. Abstract If true, the association does not provide a complete declaration and can typically not be instantiated. An abstract association is intended to be used by other associations. Leaf Indicates whether it is possible to further specialize an association. If the value is true, then it is not possible to further specialize the association. Derived Specifies whether the association is derived from other model elements such as other associations or constraints. A component represents a modular part of a system that encapsulates its contents and whose manifestation is replaceable within its environment. A component defines its behavior in terms of provided and required interfaces. As such, a component serves as a type whose conformance is defined by these provided and required interfaces (encompassing both their static as well as dynamic semantics). One component may therefore be substituted by another only if the two are type conformant. Larger pieces of a system's functionality may be assembled by reusing components as parts in an encompassing component or assembly of components, and wiring together their required and provided interfaces. A component is modeled throughout the development life cycle and successively refined into deployment and run-time. A component may be manifest by one or more artifacts, and in turn, that artifact may be deployed to its execution environment. A deployment specification may define values that parameterize the component's execution. Name The name of component. Visibility Determines where the component appears within different namespaces within the overall model, and its accessibility. Abstract If true, the component does not provide a complete declaration and can typically not be instantiated. An abstract component is intended to be used by other components. Leaf Indicates whether it is possible to further specialize an component. If the value is true, then it is not possible to further specialize the component. Active Determines whether an object specified by this component is active or not. If true, then the owning component is referred to as an active component. If false, then such a component is referred to as a passive component. Indirectly instantiated The kind of instantiation that applies to a Component. If false, the component is instantiated as an addressable object. If true, the Component is defined at design-time, but at run-time (or execution-time) an object specified by the Component does not exist, that is, the component is instantiated indirectly, through the instantiation of its realizing classifiers or parts. An association may represent a composite aggregation (i.e., a whole/part relationship). Only binary associations can be aggregations. Composite aggregation is a strong form of aggregation that requires a part instance be included in at most one composite at a time. If a composite is deleted, all of its parts are normally deleted with it. Note that a part can (where allowed) be removed from a composite before the composite is deleted, and thus not be deleted as part of the composite. 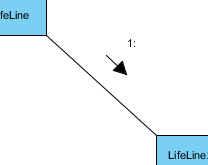 Compositions may be linked in a directed acyclic graph with transitive deletion characteristics; that is, deleting an element in one part of the graph will also result in the deletion of all elements of the subgraph below that element. Composition is represented by the isComposite attribute on the part end of the association being set to true. Name The name of composition. Abstract If true, the composition does not provide a complete declaration and can typically not be instantiated. An abstract composition is intended to be used by other compositions. Leaf Indicates whether it is possible to further specialize a composition. If the value is true, then it is not possible to further specialize the composition. Derived Specifies whether the composition is derived from other model elements such as other compositions or constraints. A condition or restriction expressed in natural language text or in a machine readable language for the purpose of declaring some of the semantics of an element. Name The name of constraint. It is optional and is commonly omitted. Expression The condition that must be true when evaluated in order for the constraint to be satisfied. A dependency is a relationship that signifies that a single or a set of model elements requires other model elements for their specification or implementation. This means that the complete semantics of the depending elements is either semantically or structurally dependent on the definition of the supplier element(s). Name The name of dependency. Supplier The element(s) independent of the client element(s), in the same respect and the same dependency relationship. In some directed dependency relationships (such as Refinement Abstractions), a common convention in the domain of class-based OO software is to put the more abstract element in this role. Despite this convention, users of UML may stipulate a sense of dependency suitable for their domain, which makes a more abstract element dependent on that which is more specific. Client The element(s) dependent on the supplier element(s). In some cases (such as a Trace Abstraction) the assignment of direction (that is, the designation of the client element) is at the discretion of the modeler, and is a stipulation. Visibility Determines where the dependency appears within different namespaces within the overall model, and its accessibility. A generalization is a taxonomic relationship between a more general classifier and a more specific classifier. Each instance of the specific classifier is also an indirect instance of the general classifier. Thus, the specific classifier inherits the features of the more general classifier. Name The name of generalization. General References the general classifier in the Generalization relationship. Specific References the specializing classifier in the Generalization relationship. Visibility Determines where the generalization relationship appears within different namespaces within the overall model, and its accessibility. Documentation Description of generalization relationship. Substitutable Indicates whether the specific classifier can be used wherever the general classifier can be used. If true, the execution traces of the specific classifier will be a superset of the execution traces of the general classifier. An instance specification is extended with the capability of being a deployment target in a deployment relationship, in the case that it is an instance of a node. It is also extended with the capability of being a deployed artifact, if it is an instance of an artifact. Name The name of instance specification. Specification A specification of how to compute, derive, or construct the instance. Documentation Description of instance specification. Classifier The classifier or classifiers of the represented instance. If multiple classifiers are specified, the instance is classified by all of them. Slots A slot giving the value or values of a structural feature of the instance. An instance specification can have one slot per structural feature of its classifiers, including inherited features. It is not necessary to model a slot for each structural feature, in which case the instance specification is a partial description. An interface is a kind of classifier that represents a declaration of a set of coherent public features and obligations. An interface specifies a contract; any instance of a classifier that realizes the interface must fulfill that contract. The obligations that may be associated with an interface are in the form of various kinds of constraints (such as pre- and postconditions) or protocol specifications, which may impose ordering restrictions on interactions through the interface. Since interfaces are declarations, they are not instantiable. Instead, an interface specification is implemented by an instance of an instantiable classifier, which means that the instantiable classifier presents a public facade that conforms to the interface specification. Note that a given classifier may implement more than one interface and that an interface may be implemented by a number of different classifiers. Name The name of interface. Parent The model element that owns the interface. Visibility Determines where the interface appears within different namespaces within the overall model, and its accessibility. Abstract If true, the class does not provide a complete declaration and can typically not be instantiated. An abstract class is intended to be used by other classes. Leaf Indicates whether it is possible to further specialize a class. If the value is true, then it is not possible to further specialize the class. Active Determines whether an object specified by this class is active or not. If true, then the owning class is referred to as an active class. If false, then such a class is referred to as a passive class. Business model Set it to make the class become a "business class"
Attributes Refers to all of the Properties that are direct (i.e., not inherited or imported) attributes of the class. Operations An operation is a behavioral feature of a class that specifies the name, type, parameters, and constraints for invoking an associated behavior. Operations here refers to the operations owned by the class. Template Parameters A TemplateableElement that has a template signature is a specification of a template. A template is a parameterized element that can be used to generate other model elements using TemplateBinding relationships. The template parameters for the template signature specify the formal parameters that will be substituted by actual parameters (or the default) in a binding. A template parameter is defined in the namespace of the template, but the template parameter represents a model element that is defined in the context of the binding. Class Code Details Properties of class in implementation (code) level. Settings in this page is programming language specific, and will affect the code being generated. Java Annotations A Java annotation is a metadata that can be added to Java source code for annotation purposes. ORM Query Available only to ORM Persistable class, ORM Query lets you define the ORM Qualifiers and named queries of the class. An association declares that there can be links between instances of the associated types. A link is a tuple with one value for each end of the association, where each value is an instance of the type of the end. Name The name of link. From The source of link. To The target of link. Classifiers The classifier or classifiers of the represented instance. If multiple classifiers are specified, the instance is classified by all of them. Slots A slot giving the value or values of a structural feature of the instance. An instance specification can have one slot per structural feature of its classifiers, including inherited features. It is not necessary to model a slot for each structural feature, in which case the link is a partial description. A note (comment) gives the ability to attach various remarks to elements. A comment carries no semantic force, but may contain information that is useful to a modeler. Name The name of note. Documentation Specifies a string that is the comment. A port is a property of a classifier that specifies a distinct interaction point between that classifier and its environment or between the (behavior of the) classifier and its internal parts. Ports are connected to properties of the classifier by connectors through which requests can be made to invoke the behavioral features of a classifier. A Port may specify the services a classifier provides (offers) to its environment as well as the services that a classifier expects (requires) of its environment. Name The name of port. Multiplicity Specifies the allowable cardinalities for an instantiation of this port. Visibility Determines where the port appears within different namespaces within the overall model, and its accessibility. Type Modifier Indicates a modifier that applies to the port. Aggregation Specifies the kind of aggregation that applies to the part. Default Value A String that is evaluated to give a default value for the Property when an object of the owning Classifier is instantiated. Redefined Port A port may be redefined when its containing classifier is specialized. The redefining port may have additional interfaces to those that are associated with the redefined port or it may replace an interface by one of its subtypes. Static Specifies whether this feature characterizes individual instances classified by the classifier (false) or the classifier itself (true). Read Only If true, the attribute may only be read, and not written. Derive Specifies whether the port is derived, i.e., whether its value or values can be computed from other information. Derived Union Specifies whether the port is derived as the union of all of the ports that are constrained to subset it. Service If true, indicates that this port is used to provide the published functionality of a classifier. If false, this port is used to implement the classifier but is not part of the essential externally-visible functionality of the classifier and can, therefore, be altered or deleted along with the internal implementation of the classifier and other properties that are considered part of its implementation. Behavior Specifies whether requests arriving at this port are sent to the classifier behavior of this classifier. Such ports are referred to as behavior port. Any invocation of a behavioral feature targeted at a behavior port will be handled by the instance of the owning classifier itself, rather than by any instances that this classifier may contain. Realization is a specialized abstraction relationship between two sets of model elements, one representing a specification (the supplier) and the other represents an implementation of the latter (the client). Realization can be used to model stepwise refinement, optimizations, transformations, templates, model synthesis, framework composition, etc. Name The name of realization relationship. Visibility Determines where the realization relationship appears within different namespaces within the overall model, and its accessibility. Mapping A composition of an Expression that states the abstraction relationship between the supplier and the client. In some cases, such as Derivation, it is usually formal and unidirectional. In other cases, such as Trace, it is usually informal and bidirectional. The mapping expression is optional and may be omitted if the precise relationship between the elements is not specified. Documentation Description of realization relationship. A usage is a relationship in which one element requires another element (or set of elements) for its full implementation or operation. In the metamodel, a Usage is a Dependency in which the client requires the presence of the supplier. Name The name of usage relationship. Visibility Determines where the usage relationship appears within different namespaces within the overall model, and its accessibility. Documentation Description of usage relationship. Definition of notations is quoted from Object Management Group Unified Modeling Language (OMG UML) Superstructure Version 2.2 and former versions (for notations that do not exist anymore in latest specification).